For many babies and their families, the Neonatal Intensive Care Unit (NICU) becomes a home-away-from-home as premature newborns stabilize and become strong enough to be discharged. Caring for acutely ill and premature infants born as young as 30 weeks, this could mean ten or more weeks spent surrounded by nurses and beeping machines. The unit just moved to its new home on the fourth floor of the Interior Heart & Surgical Centre on March 6th and can now support up to 20 babies at a time requiring specialized treatment and attention. One of the items required in the NICU is a pediatric Digital Imaging Plate for their portable x-ray machine at a cost of $63,000. As the lungs are one of the last organs to develop, babies born early are at a high risk of developing breathing problems. As a result, most x-rays in the unit are done for those babies in respiratory distress. Every moment that a baby is deprived of oxygen puts them at risk for a variety of conditions including lifetime respiratory problems and potentially even brain damage. Using current technology, an x-ray can take up to 15 minutes or more per shot to process which can be too long for fragile newborns facing respiratory challenges. The addition of the new Digital Imaging Plate will allow x-ray images to be viewed instantly. This specialized pediatric version is also significantly smaller than the traditional plate, resembling the size of a notebook. 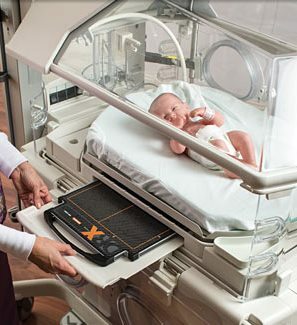 It fits inside an incubator so there is as little disruption to the baby as possible. Also, with this new technology, a reshoot can be done immediately if the first image isn’t clear enough, or if it’s needed to confirm a tube is in the right place. “Having timely answers allows us to make timely, life-saving decisions,” Bonnie says of the equipment’s advantages. Help us purchase this critical piece of equipment with a gift today. Your support will give breath back to a premature baby who needs all the help it can get. It will provide relief to worrying parents during emotionally trying times. Please give generously as every dollar brings us closer to giving the NICU team all the tools they need to save and change lives. With the support of yourself and other caring community members, sick and premature babies will have access to the best equipment and as a result, get to go home to their very own nursery even sooner. Thank you for helping to build a better future for our smallest patients.